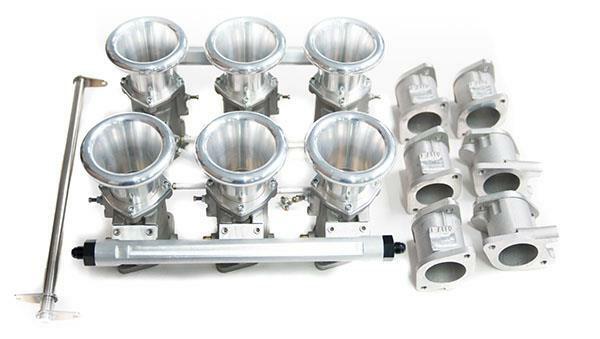 The ultimate throttle body package for flat six Porsche applications, this integrated system utilizes special manifolds which, unlike the old carburetor manifolds, permit the intake charge a “straight shot” at the valve. 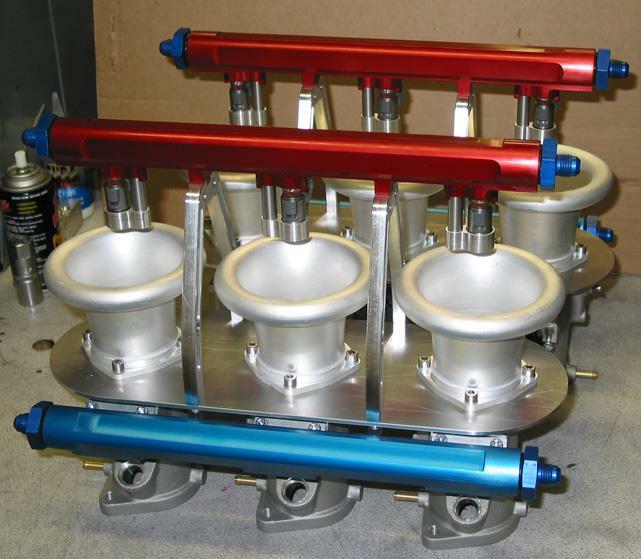 The system allows three alternative injector positions: one at the manifold/head interface, one downstream of the throttle plate in the throttle body, and one in the air horn. In normal production, only the injector pocket in the throttle body is drilled. 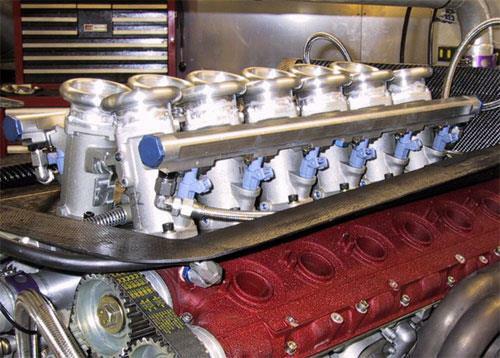 Essentially six individual throttle bodies, these units are not adversely affected by unequal thermal expansion in separate cylinders. 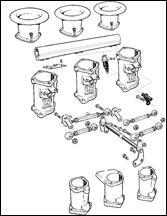 3006 Series throttle bodies are equipped with pockets for standard Bosch, Lucas, Rochester, or Weber injectors, using an O-ring top and bottom. Each barrel has an air by-pass screw. One unit incorporates a drive and mounting pad for a Borla Induction throttle position sensor. Sizes available 48, 50, 52, and 54 mm. 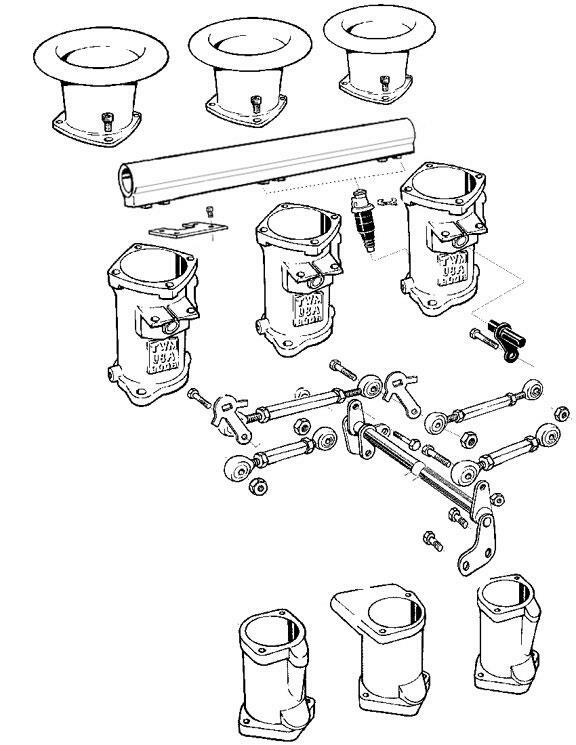 There are integral mounts for the Dash 10 size fuel rail. 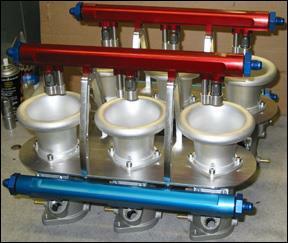 A manifold referenced, fuel pressure regulator, Part No. 203133 is available. 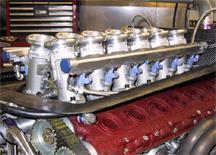 Here is an example of our 3006 Series Throttles on a V-12 Ferrari. Weight: 6.75 Kg 14.85 lb.